Let's start with the end of the second trailer. The last scene, the stone mammoth coming out and his fellows cheering him, Thor smashing him up into the air with his hammer, intentionally invokes the Biblical account of David and Goliath, when the young David takes on the Philistines' giant champion Goliath and saves Israel from destruction (David and Goliath has long been a traditional theme to which artists resort to depict their own culture and times; for more, please see 3 David, 3 Theologies: Donatello, Michelangelo, Bernini). We can also say it invokes another work of art invoking the David and Goliath story, 300, when the Spartan Astinos slays the giant rhino, or King Leonides fights the huge, scarred giant. But then,.... Thor's kinda cocky about this, isn't he? Didn't we see him being cocky at the start of Thor? 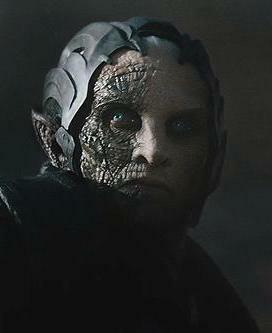 This is the best image I can find of Malekith, the leader of the Dark Elves who try to destroy Asgard and earth. Previously, we have discussed why film makers would choose "elves" to battle Thor, the god of thunder, the masculine Chris Hemsworth; rather anti-climatic, isn't it? I mean, elves work at the toy shop for North in Rise Of the Guardians, elves aided Frodo in Lord Of the Rings, and Orlando Bloom doesn't look really hostile in The Hobbit, not with those flowing locks of blond hair, or his father, sitting atop a giant moose? But as we surmised earlier, I think that's exactly the point: we don't think of elves as being dark, evil enemies of the universe; we trust elves, we can't imagine how they could possibly betray us, and yet, that's exactly what has happened. For example, how could Thor have imagined his brother Loki would betray him (more on this below)? Just as Loki disguises himself, so Malekith has a "double face," like the villain "Two Face" (Aaron Eckhart) in The Dark Knight. The "polished" left side of the Dark Elf''s face, and the burned, decayed right side stand in stark contrast to each other, and is probably signaling to us, the viewer, that someone in our own society has been "two-faced," presenting one face to us while hiding another; now, who could that be? It appears, however, that Malekith is just an errand boy for a far greater, darker evil than what he himself is, and that was teased to us in the first of two post-credits scenes for The Avengers (the second post credits scene being the Avengers at the dive, eating). What else can we tell of Malekith? His blue eyes remind me of the White Orc's in The Hobbit: the Desolation of Smaug. 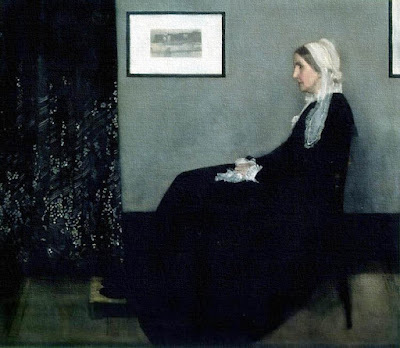 As we know, like all colors, blue symbolizes one of two things: depression/sadness, or wisdom. It's probable, given he's a villain, his blue eyes are meant to convey to us that he sees the world through his personal tragedies in life, he expects the world to pay for the wrongs that have been done to him/what he has been forced to suffer. He also has white hair. In a virtuous sense, white symbolizes faith, purity, innocence, because these virtues give life to the soul, cleansing it of the impurities of worldliness; on the other hand, a corpse turns white as it decays because it has no life, i.e., a person lacks faith, hope, purity, innocence, all the things giving the soul life, so the soul has died within that person. Since it's Malekith's hair that is white, that means his thoughts (hair communicates to the audience what the thoughts are) are those devoid of life and filled with death. That his hair is braided suggests he is disciplined--as opposed to being wild, like we see Loki's dishevelled hair at the end of the first trailer--and he keeps a tight grips on his emotions/thoughts/actions. Interestingly, we see part of Thor's long hair braided in the back as well, comparing the two; it's possible that, whereas Thor has had to learn discipline to keep from being so arrogant, Malekith's discipline might be his deadly undoing, or some such comparison between the two enemies as that. 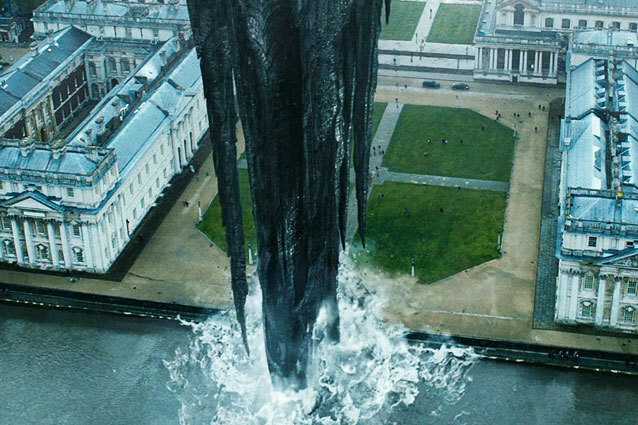 As we discussed yesterday, with Percy Jackson and the Olympians: Sea Of Monsters, Percy battles Kronos, the god of darkness and chaos, who gave birth to the Olympians, the same as Odin (Sir Anthony Hopkins) warns of Darkness that existed before the Universe was formed. 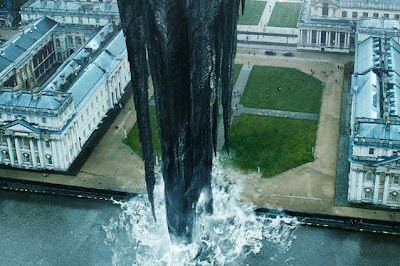 In both cases, the order that resulted from the darkness and chaos (the Olympians in Percy Jackson and the Universe/fabric of reality in Thor) is being threatened. How does that relate today? It can't be a coincidence that these films both depend upon total destruction of the universe (like Enders Game and every other film coming out lately) from Darkness; so what does Darkness mean? Tom Hiddleston as Loki. What can we say of Loki from these two trailers? Bitter. Bitter is probably a very safe start. Thor the Dark World takes place one year after the events in The Avengers, so Loki's been incarcerated for about that length of time. As we saw Loki imprisoned in a transparent cell in The Avengers, and Khan aboard the Enterprise in Star Trek Into Darkness, and Silva in Skyfall (all invoking Hannibal Lecter from Silence Of the Lambs), we see him again, in the same situation. As we deduced earlier, the "see-through prison" being employed by so many films as of late is probably meant to offer us a deception, just like the characters in the films: we, and the characters, think we "see everything" and have the prisoner in a totally vulnerable position where he can't possibly hide anything, granting us faulty security. 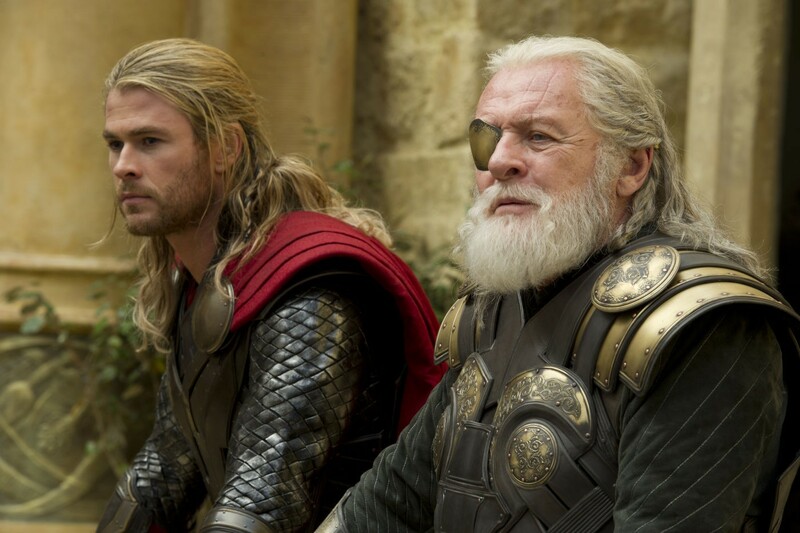 So, what's the faulty security of Thor as he goes to talk to Loki in his prison? Thor thinks he's playing it safe by realizing he can't trust Loki, and everyone else thinks that's all there is to "see" about letting Loki out, he can't be trusted. Granted, that's a pretty big deal, but I suspect there is a hidden agreement between Loki and Malekith OR, from the history of the comic books, LOKI MIGHT NOT EVEN BE LOKI. It's possible that Malekith has disguised himself as Loki, the god of mischief, because that happens in the comics, and Loki is certainly fond of making a fool of his brother by always projecting a false Loki image to lead his brother astray (more on that below). 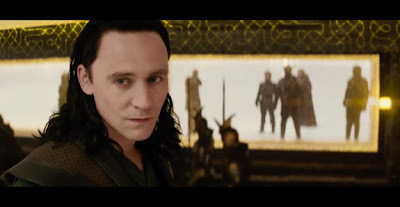 Part of what we will need to look for regarding Loki (one of many features) is his understanding of why he's in prison: does he acknowledge what he did was wrong, or does he blame Thor and Odin for driving him to do it? Does he play himself a victim, like Democrats teach people to do, or does he take responsibility for his actions? 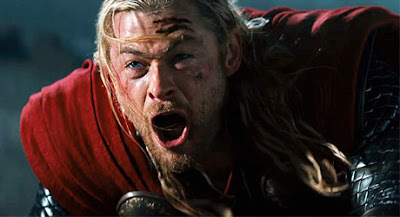 When Jane (Natalie Portman) punches Loki in the face in the second trailer, and says, "That's for New York," Loki doesn't try to stop her, he doesn't hit her back or curse her; it's possibly more frightening that he says, "I like her," but that line is to remind US the viewers what Loki did in New York. Darkness is equivalent to slavery: slavery to another person/overlord, slavery to ignorance, slavery to the qualities we see in Malekith and Loki (false ambition, revenge, worldliness, lack of faith, deception, hatred of others), slavery to survival instead of the freedom to choose your own path. The recent biggest blockbuster, The Conjuring (very anti-capitalist), suggested (through the lineage of the witch Bathsheba being descended from a woman accused during the Salem Witch trials) that people who came to America were leaving "enlightenment" and coming to America to spread Satanism and become demons because to the makers of The Conjuring, that's what America has become (please see The Devil's Hour: The Conjuring & Demonic Possessions for more). We have all ready discussed, in The Avengers, why Thor isn't Loki's fool: because Thor genuinely loves Loki, and a part of loving someone is trusting them. Likewise, Thor is a hero, there is no deception in him, and because Thor wouldn't deceive anyone (like he tells Jane, "I gave you my word," I had no intention of deceiving you) Thor can't imagine anyone else deceiving him because it's not within the realm of his imagination to be able to come up with that. He tells Loki that he knows Loki is going to betray him,... okay, then don't let Loki out. No, that's not the point, Thor--being the ultimate good guy--wants Loki, his brother in his heart, to redeem himself, and that's why Thor comes to Loki for help. That's what the red cape Thor wears means: love, and the burden that love is. Loki, on the other hand, because he is so full of deception, and only deceives others, can't imagine anyone NOT deceiving him, which is probably why Loki is so bitter about being adopted: he can't understand that Odin genuinely loved him, that Thor genuinely loves him, but that Loki was the victim of some grand deception and that might be the germ of his revenge he seeks. So, if Thor love Loki so much, why has Thor not come to see him in a year? Perhaps because Loki was dead to Thor: the terrible crimes Loki committed in New York, and against Asgard, could not be reconciled in Thor's heart with his brother that he loved or, it could be, that Thor hoped his brother would realize how much he missed be a part of a family who cared for him and experience remorse; it's also possible that Thor was so angry with Loki--because anger is the opposite of love--that he couldn't bear to see his brother for fear of killing him out of rage. That last one is unlikely, and I am confident the film will answer that for us, and Thor will answer it for Loki, but as I have written previously, even though Thor threatens to kill Loki "when" Loki betrays Thor, Thor could no more kill Loki than he could kill Jane. Does the ship remind you of another ship we have seen lately? What about General Zod's ship in Man Of Steel, with the "dangling" part we see in the image above? Why design a ship that way? That's so unlike the aero-dynamic ships we are used to seeing in space,... and that's probably why: how easy would it be to go at the speed of light in a ship shaped like that? It wouldn't. That's a totally inefficient design, and that's what it's supposed to convey: ineptitude in innovation. People who rally for whatever the villains in the film will stand for, are also the type of people who are so dumb, they would design a space ship to look like the one we see above. Who does the army of Dark Elves remind you of? Storm Troopers? Or maybe the Immortals from 300? Please recall, originally, 300: Rise Of An Empire was supposed to be opening this month, ahead of Thor the Dark World, but it was moved to next spring. Why? The blacked-out eyes, like vampires, are meant--at the very least--to convey not only a real, mortal threat (death) but a super-natural/other-worldly threat as well: damnation. 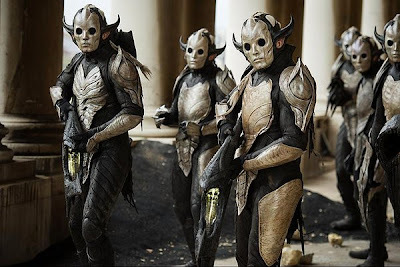 These aren't just elves with fancy phasers, there is the element of the demonic about them, hence, why they wear "gold" armor: gold usually signifies a king because only a king can afford it and it's the only gift fit for a king, like Thor; but it can also symbolize the pursuit of gold, and worldly pleasures in general. In 300, Leonides and the Spartans were the idealists, not being bought off or saving their own lives to allow their people to live in slavery to Xerxes, but that slavery is facing us again, so we get another reminder about the Spartans and their sacrifice, and it will be similar to what we are going to see in Thor 2. It's important that Odin tells Thor about Darkness and what it is, because he is so old, it reminds us of the value of our senior citizens and the value of their experience. In socialism, the government is always happy to implement death panels and euthanasia, the killing of people who are not productive in society, specifically, people on medication or who are no longer working due to advance age. A socialist system is so poor, it can't support more than the absolute necessities, unlike capitalism that can extend a huge safety net, but the prime reason to kill the elders off is because the elders remember, and because of personal experience--like Captain America remembering how Hitler sounded during World War II--older people don't fall for socialism's little bag of tricks as easily as young people do, like all the "young people" supposedly in love with Obama. We should look for Odin to be validating the knowledge and wisdom of our senior citizens, among other virtues I am sure he will exhibit. Sometimes, there is evil so evil, you forgive and combine strengths. Is this the same as in Star Trek Into Darkness, when Kirk tells Spock, "The enemy of my enemy is my friend?" No, but it is the same as during the War of 1812 when lawmakers teamed up with local pirates in the New Orleans area to help fight off the English, or Hobbs (Dwayne Johnson) teaming up with Dom to capture Shaw in Fast and Furious 6, or the US army "helping" (ha ha, isn't that cute?) Superman defeat General Zod in Man Of Steel. Why do it this way? Perhaps to encourage real American spirit for all Americans--in spite of their differences in the past--to bond together to overcome the evil facing us, and the world, trying to plunge us back into darkness. Everything I have seen and read about this film insures it's going to be awesome on every level!